The programme itself is essentially a loss leader designed to drive footfall and digital downloads. Its incredible offer is available exclusively through the company’s app, the latest sign that the brand believes in the power of digital to drive its business performance by creating unprecedented opportunities to up-sell its core products to hungry customers once they arrive in store. In this article, we review the latest digital concepts that are proving so successful for the world’s second largest fast food/hamburger brand. Burger King has invested heavily in the lucrative and growing coffee market since 2014 when it moved to Canada and acquired Tim Horton’s for $11.4 billion, creating the world’s third largest quick-service restaurant company – “Restaurant Brands International” which continues to operate the two iconic and independent brands. Described as “America’s most beloved beverage”, coffee consumption shows no sign of slowing down, with 63% of Americans drinking it daily, however price hikes in recent years by leading retailers such as Starbucks are creating market opportunities to leverage pricing in order to offer more affordable refreshments to customers in the USA, in the same way we’ve seen in other markets such as China. 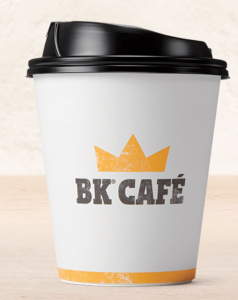 Available exclusively in the United States (for now), the BK® Café $5 monthly subscription offer launched on March 15th and entitles customers to one small cup of brewed hot coffee daily, and explicitly excludes “specialty, iced, frappé and other coffee beverages”. It’s a high impact headline, clearly focused on cost-conscious consumers, despite more impressive market growth and the “surprising trend” for increased consumption of gourmet coffee. While the $5 subscription campaign is a great example of Burger King’s strategy of simplifying its business image, more than a year of complex planning was needed for its previous digital concept dubbed the “The Whopper Detour”. The campaign concept was provocative and risky, offering 1 cent whopper burgers to customers who ordered on the newly launched Burger King app within 600 feet of a McDonald’s restaurant, and collected their burger in Burger King itself. Using geo-fencing technology, Burger King ran the promotion for just one week in December 2018, yet announced a surge of over 4 million digital downloads in their most recently quarterly figures, with “about 1 million of those coming in the 36 hours after Whopper Detour launched”. While not completely surprising given the growth of gamification techniques, the “Whopper Detour” was a nevertheless a stunt concept that was just “weird enough to work“. Who’s Winning the QSR War? The battle is far from over however, as Burger King has only recently announced plans to improve its in-store experience, implementing ideas that competitors began launching several years ago. At least in terms of its marketing efforts, the brand is seen to be “propelling forward thanks to stellar digital campaigns”, with the most recent analysis of restaurant chains worldwide showing significant improvements for Burger King’s global brand value. So whether your brand is more suitable to a subscription campaign like this new BK® Café concept or more daring stunts like their digital challenge to competitors, we are clearly advocates of the power of digital channels to drive customer loyalty and clear commercial returns.